U.S. President Donald Trump’s executive order to build a concrete wall on the U.S.-Mexico border caught the Native American tribe the Tohono O’odham completely off-guard. I have mentioned this tribe before. For centuries the Tohono O’odham have lived in the Sonora Desert between what is now the United States and Mexico. Their presence for where they are now is believed to have occurred as long ago as the 15th Century. Even when two-thirds of the tribe had been incorporated within the United States, they were allowed to go and visit their people just across the border in Mexico without hindrance. This started to change in the late 20th Century when the U.S. government started putting more U.S. Border Patrol on the U.S.-Mexico border. The Tohono O’odham were caught in the middle and many of their people were detained, harassed and threatened. Former U.S. President Barack Obama tried to alleviate the situation by allowing the tribe in Mexico to go see their families and neighbors on the U.S. side of the border. This situation has suddenly changed. Tohono O’odham chief Verlon M. Jose said that U.S. President Trump did not consult Jose or anyone else in the tribe when Trump decided to sign his executive order for an actual wall to separate the U.S.-Mexico border physically. This wall would also run through Tohono O’odham tribal land and cause extreme damage to the tribe. The damage will range from destruction of the environment to permanently cutting off the Tohono O’odham in Mexico from their kin in the United States. There is no question that this is a declaration of war by Trump against the Tohono O’odham, and that the Tohono O’odham have made it clear that they will resist in both court and also using mass protests and sit-in tactics to safeguard their land. With 28,000 tribal members, the Tohono O’odham are the largest tribe on the U.S.-Mexico border. If they resist, then the chances are other Native American tribes on the U.S.-Mexico border will equally resist the building of this physical wall. They know what is at stake—their land and their sovereignty. Nothing less. These people, who have been around since prehistory of the United States, will NOT give up what is theirs. I find it a sad case that those in power, and especially the current president, do not see the injustice that is being heaped upon these harmless and peaceful people. 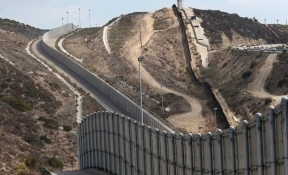 I have to ask is it really in the interest of the United States, Mexico, or the planet Earth to build something that is as useless as this wall? © 7657 Chicago Hispanic Newspaper, Lawndale News, Hispanic Bilingual Newspapers, Su Noticiero Bilingue. All rights reserved. XHTML / CSS Valid.